This article is about birds in family Turdidae. For other birds known as thrushes, see Thrush (disambiguation) § Birds. For the mouth disease, see candidiasis. Thrushes make up the Turdidae, a family of passerine birds that occurs worldwide. Thrushes are plump, soft-plumaged, small to medium-sized birds, inhabiting wooded areas, and often feed on the ground. The smallest thrush may be the forest rock thrush, at 21 g (0.74 oz) and 14.5 cm (5.7 in). However, the shortwings, which have ambiguous alliances with both thrushes and Old World flycatchers, can be even smaller. The lesser shortwing averages 12 cm (4.7 in). The largest thrush is the blue whistling thrush, at 178 g (6.3 oz) and 33 cm (13 in). The great thrush is similar in length, but less heavily built. Most species are grey or brown in colour, often with speckled underparts. They are insectivorous, but most species also eat worms, land snails, and fruit. Many species are permanently resident in warm climates, while others migrate to higher latitudes during summer, often over considerable distances. Thrushes build cup-shaped nests, sometimes lining them with mud. They lay two to five speckled eggs, sometimes laying two or more clutches per year. Both parents help in raising the young. 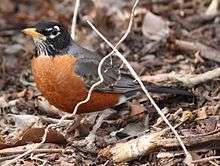 The songs of some species, including members of the genera Catharus, Myadestes, Sialia and Turdus, are considered to be among the most beautiful in the avian world. Turdidae species spread the seeds of plants, contributing to the dispersal of many species and the recovery of ecosystems. Plants have limited seed dispersal mobility away from the parent plant and consequently rely upon a variety of dispersal vectors to transport their propagules, including both abiotic and biotic vectors. Seeds can be dispersed away from the parent plant individually or collectively, as well as dispersed in both space and time. Many bats and birds rely heavily on fruits for their diet, including birds in the families Cotingidae, Columbidae, Trogonidae, Turdidae, and Ramphastidae. While eating fruit, these animals swallow seeds and then later regurgitate them or pass them in their faeces. Such ornithochory has been a major mechanism of seed dispersal across ocean barriers. Other seeds may stick to the feet or feathers of birds, and in this way may travel long distances. Seeds of grasses, spores of algae, and the eggs of molluscs and other invertebrates commonly establish in remote areas after long journeys of this sort. The Turdidae have a great ecological importance because some populations migrate long distances and disperse the seeds of endangered plant species at new sites, helping to eliminate inbreeding and increasing the genetic diversity of local flora. The taxonomic treatment of this large family has varied significantly in recent years. Traditionally, the Turdidae included the small Old World species, like the nightingale and European robin in the subfamily Saxicolinae, but most authorities now place this group in the Old World flycatcher family Muscicapidae. The family formerly included more species. At the time of the publication of the third edition of Howard and Moore Complete Checklist of the Birds of the World in 2003, the genera Myophonus, Alethe, Brachypteryx and Monticola were included in Turdidae. Subsequent molecular phylogenetic studies have shown that the species in these four genera are more closely related to species in the family Muscicapidae. As a consequence, these four genera are now placed in Muscicapidae. In contrast, the genus Cochoa which had previously been placed in Muscicapidae was shown to belong in Turdidae. For other species previously in the Turdidae, see Muscicapidae and chats. 1 2 Perrins, C. (1991). Forshaw, Joseph, ed. Encyclopaedia of Animals: Birds. London: Merehurst Press. pp. 186–187. ISBN 1-85391-186-0. ↑ "Beautiful wood thrushes.........". Houzz. ↑ "The Hermit Thrush in Minnesota". 1 2 Voelker, G.; Spellman, G.M. (2004). "Nuclear and mitochondrial DNA evidence of polyphyly in the avian superfamily Muscicapoidea". Molecular Phylogenetics and Evolution. 30: 386–394. doi:10.1016/S1055-7903(03)00191-X. 1 2 Sangster, G.; Alström, P.; Forsmark, E.; Olsson, U. (2010). "Multi-locus phylogenetic analysis of Old World chats and flycatchers reveals extensive paraphyly at family, subfamily and genus level (Aves: Muscicapidae)". Molecular Phylogenetics and Evolution. 57 (1): 380–392. doi:10.1016/j.ympev.2010.07.008. ↑ Gill, Frank; Donsker, David, eds. (2016). "Chats, Old World flycatchers". World Bird List Version 6.2. International Ornithologists' Union. Retrieved 20 May 2016.